The Tradesman grinding process is much different than that of traditional processes. Our DC motor and control provides 600% more torque than AC grinders through the full range of 400 to 4000 RPM in forward or reverse (option). Quiet. 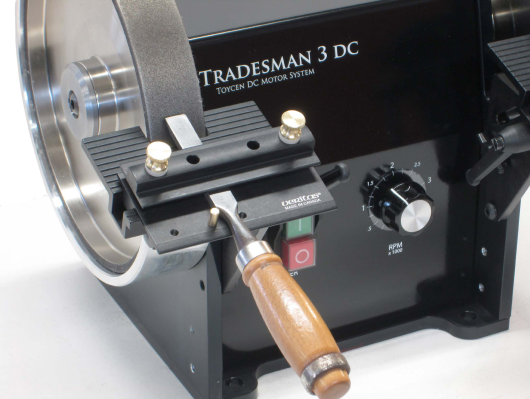 The Tradesman is so quiet that you can hear when something small comes in contact with the wheel – picture sharpening a sewing needle. Powerful. that otherwise goes into heat and friction with stone wheels. Cool. The Tradesman Torque Compensating DC Motor system is very powerful even at speeds below 500 RPM. Grind plastic, carbon fiber, ceramics, glass and carbide (anything) on one workstation.